My clients are smart, accomplished, interesting people. And that includes Michelle, who emailed me 45 minutes before our call last week to tell me that she was an undisciplined slacker. In the four months we’ve been working together she’s made (and is making) great headway on one personal and two professional goals, all of which require big changes in her thinking, habits, and actions. But in that moment, what she wanted was to just hurry it up so she could get there and be done. Who hasn’t felt like that?! Once you decide to tackle a change, it’s human nature to want it to magically happen overnight. Presto, chango – you’re different and so is your situation! But that’s not how change works. … clearer, calmer, happier, better, faster, healthier, organized-er, confident-er, focused-er (I know those last three words don’t really end in “er,” but in this case they do), or whatever change or goal you’re working towards. Each week that you’re a little more “er” than the last one, you’ve made progress. Aggregate enough “ers” – today I’m calmer than I was yesterday, which was calmer than last week, which was calmer than last month, which was calmer than six months ago – and you’ve created substantial sustainable change. 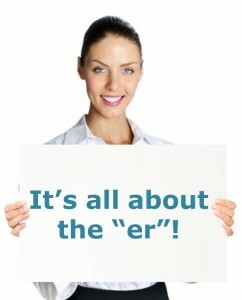 Focusing on the “er” also makes the difference between making progress quickly versus feeling like it’s taking forever. On the other hand, it doesn’t take long to be a teeny bit more of something … a teeny bit more organized, faster, better, or calmer. When you focus on the tiny incremental bits – the “er” – you quickly see you’ve made progress. And progress creates momentum which boosts motivation which creates progress which builds momentum … well, you get the picture :-). 1. Get VERY specific with what your “er” looks like. I’ve recently started working with a client who’s being considered for a big promotion. She truly believes she’s qualified and deserves it, and has no trouble talking about her skills. Her “er” is getting more comfortable – comfortable-er – every time she practices describing her successes. 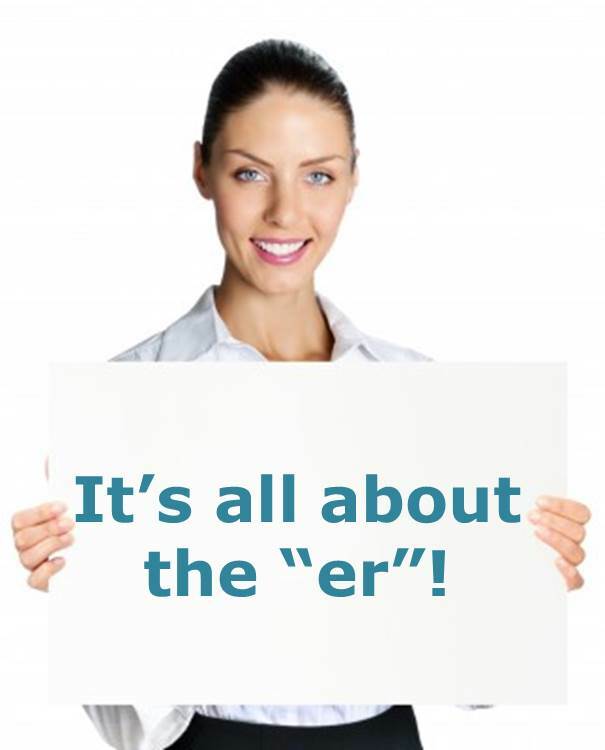 Define your “er” (which might include making up a word – so have fun with it!). 2. Commit to consistent action. It’s impossible not to make progress when you’re in action. Every itsy-bitsy step leads you just a little closer (another er-word) to where you want to be. 3. Make a choice to believe you WILL be successful. Progress is never a straight line. When you hold the belief that “yes I can!” you’re much more likely to persist when you run into obstacles, set-backs, or missteps. It’s that stick-to-it-iveness that keeps your “er” moving. When you start to work on change, your STUFF shows up … resistance, a noisy inner critic, procrastination, a certainty that moving to a new country and starting over from scratch would be easier than this, etc. Likewise, when you hit bumps, your STUFF will also show up. You’ll have three choices: engage in a power struggle with your STUFF (low odds of you winning), give in to your STUFF and give up (bad idea), or decide that everything that comes up is incredibly interesting (pick this one – it’s STUFF kryptonite!). 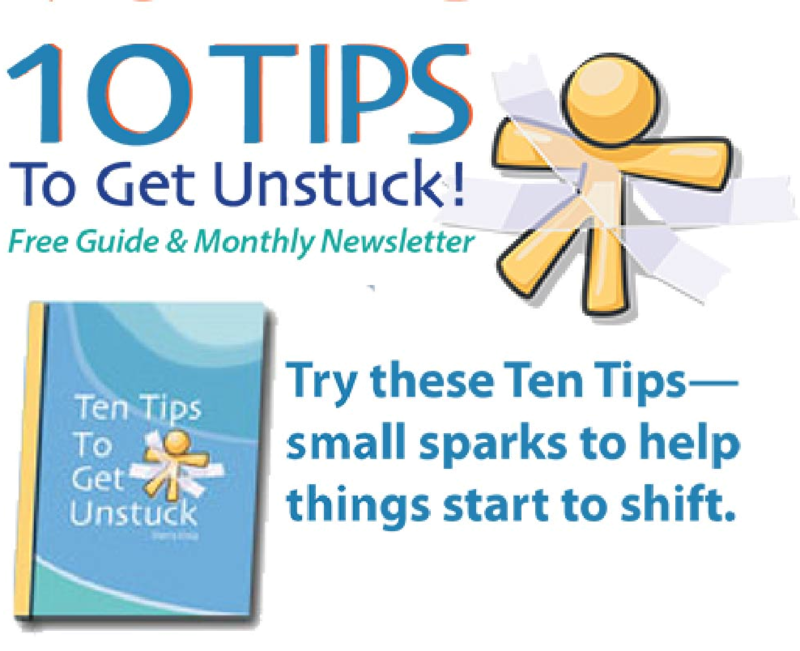 Getting unstuck is all about creating the capacity for more … more happiness, more fulfillment, more success on your terms … and that happens one “er” at a time.